There were many variations of the snorting bull emblem sported by various U-boats during the course of the war; the snorting bull on U-593. for example, differed from most boats in that it was imposed upon a black circle. Surrounding this black circle was a white border. 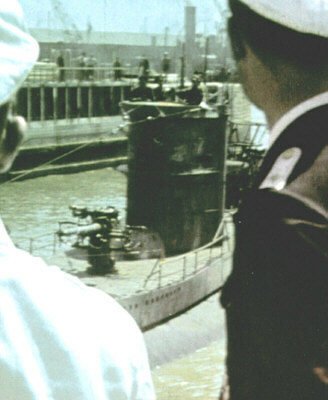 U-593's snorting bull insignia, which was painted upon a black circle. The personal insignia can be seen at the front of the tower. According to U-Boat Emblems Of World War II 1939-1945 by Georg Högel, the following U-boats sported the snorting bull insignia at some stages in their careers: U-46, U-47, U-48, U-73, U-74, U-75, U-77, U-93, U-94, U-96, U-98, U-101, U-103, U-135, U-207, U-213, U-221, U-224, U-227, U-266, U-267, U-281, U-358, U-359, U-382, U-390, U-406, U-409, U-415, U-434, U-436, U-442, U-454, U-455, U-528, U-531, U-551, U-552, U-553, U-567, U-575, U-576, U-578, U-590, U-593, U-594, U-607, U-617, U618, U-614, U-650, U-662, U-667, U-707, U-709, U-714, U-751 and U-976. 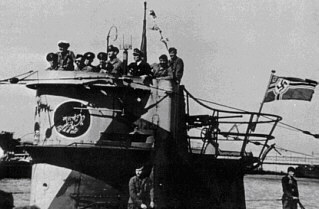 Therefore, at least 58 U-boats sported the snorting bull insignia. At least 54 U-boats adopted the bull as a flotilla insignia, while U-47, U-46, U-567 and U-213 adopted the bull as a personal insignia. Colour photos of U-boats with the snorting bull insignia are extremely rare. This shot shows a 7th U-Flottille boat arriving back from patrol at St. Nazaire in bright sunshine.